#ThatBusinessShow – weekdays at 8am on 1250WHNZ and always bring a positive message to our community. Learn more about the show at http://www.tampabayradio.com and email Jamie@tampabayradio.com for information on appearing as a guest or to become part of the show! Today’s show was amazing and highly informative with some comedic flare mixed in as well. 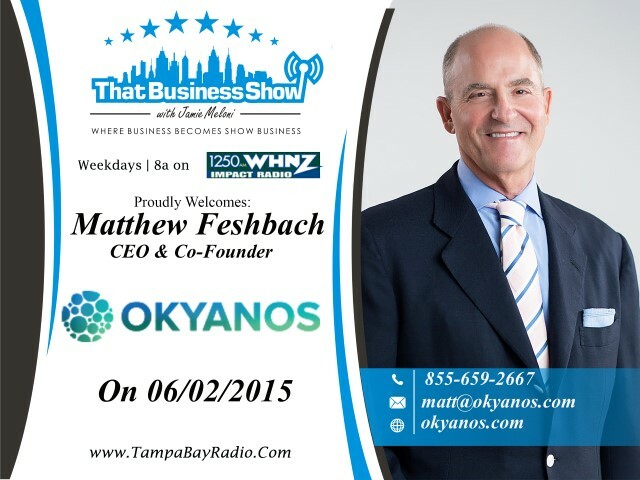 Opening the show was Matthew Feshbach, CEO and Co-Founder of Okyanos. Okyanos is a pioneering company that uses adult stem cells to treat a variety of chronic inflammatory diseases from heart disease to back pain and many more. Matthew has been a life long entrepreneur and investor going back over 30 years beginning with the launch of the first Hedge Fund that focused on a shorting of stocks only whereas others focused on the traditional scheme of looking for stocks to increase in value. Matthew then shifted his focus to stem cell research in 2009 after being introduced to a public company in the field of cell biology which led him to adult stem cell therapies through his research in the field. Seeing the value in this medical field, Matthew along with his brother Manuel Vianna, launched Okaynos to provide patients with an alternative treatment option for chronic conditions through the use of their own adult stem cells. We touched on many aspects of what stem cells are and how they work inside our bodies. Think of them as little doctors that go to work in a region in the body that needs repairs from a disease and they work to reduce inflammation and restore degenerative tissue. Through a procedure that is minimally invasive, Doctors remove adipose tissue from your own body and then separate out the stem cells and then relocate them to the area affected, the stem cells take it from there. The results have been phenomenal and Matthew shares some of the success stories on this segment. There is a wealth of other information on the website at http://www.okyanos.com and contact them directly at 855-659-2667 to learn more and see if you are a candidate for this revolutionary procedure! We shifted focus from a topic of continuing life on the first half of the show to a more morbid topic, Cremations. 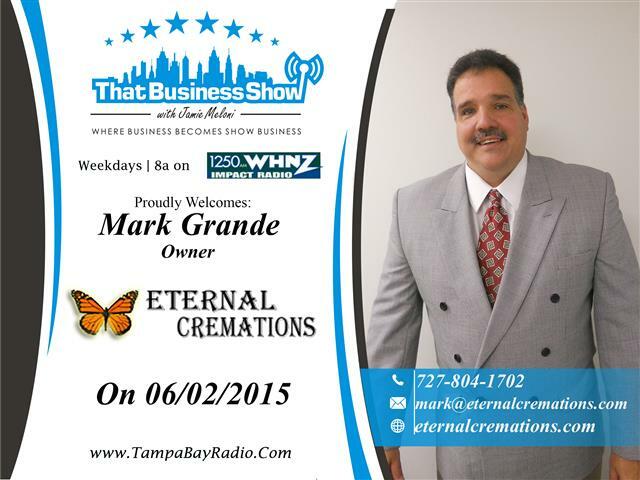 Mark Grande, Owner of Eternal Cremations was in studio with me on the 2nd half of the show and we joked up front that we had competitors in the room as Matthew’s company is looking to put Mark’s business out of business by extending life so to speak. Mark’s segment was highly informative and he shares many of the need to know topics on burials/cremations on this segment. After 16 years in the life insurance business, Mark and his family started Eternal Cremations 5 years ago and he shares that story as well as touches on issues such as Power of Attorneys that expire at a person’s death and why that is important when dealing with the funeral/cremation details as well as how the Medicaid death benefit works and much, much more! Their service is offered at $915.00 complete and you can learn more at http://www.eternalcremations.com. Their phone number is 727-804-1702 and you can email Mark directly at mark@eternalcremations.com!